Two persons were swept out to sea, one on July 22nd and one on 25th, North of Cabo San Lucas on the Pacific side, in the largest surf of the season. The first victim, Linward Garrett, was a 30 year old African American from Dallas, Texas, who came to Los Cabos with his wife, Augustina, for a one week vacation to celebrate their first wedding anniversary. As the surf picked up on July 22, they went swimming at Los Cerritos, a surfing beach just South of Todos Santos, when a strong rip tide began pulling her away from shore and into the ocean. Her husband was able to reach her in time, and push her back towards shore to safety. She survived, however he was swept away in the under current. The family contacted me to assist in the search, as I know the coastline well from flying an ultralight trike and spotting whales for tourists for the past 5 seasons. The brother of the victim, David, contracted me to fly him up and down the coast to search for the body. 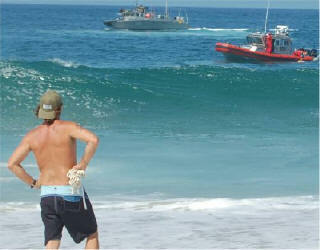 On the evening of July 24, we spotted a body floating about 50 yards off shore, 15 miles North of Cabo San Lucas. We landed on the beach, and since David didn’t swim, I stripped off all my clothes and dove into the surf. The body was floating just outside the breakers, infront of some rocks. I was able to get out past the 10 foot waves, in front of the rocks, and grab the body and swim towards shore. But on the way in, I was hit by a set wave and pulled underwater with body. I held onto the leg and continued to swim towards shore, and was hit by another set wave that ripped the leg from my hands and took the body and me under water. I surfaced and began looking all around for the body, but it was sucked underwater and nowhere in sight. It was now almost dark, and David was still waiting on shore, so I swam in by myself, we got in the plane to continue the search, and now could not locate the body by air either. We came back at 7am the next morning on July 25, and found the body again, about 50 yards off shore and just South of where it was the night before. The waves had calmed down, and there were Mexican Marines on the beach also looking for the body, so we circled it several times, landed on the beach, and directed the Marines to the body. They radioed for 2 rescue boats, who hooked the floating body and drug it up onto the deck their boat. However, this body was not the one we were looking for. It was that of a local 42 year old Mexican national, Francisco Sandoval, who moved to Cabo San Lucas years ago from Mazatlan with his family. 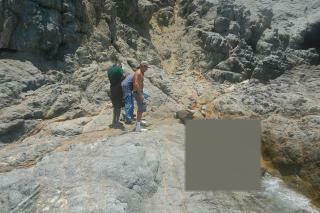 He was identified by his 23 year old son who was also down at the beach aiding in the search for his father. He said had been fishing off the rocks with his Dad the day before when a large wave grabbed him and swept him out to sea. By this time, the entire family of Linward Garrett Jr. had flown into Cabo to aid in his search and console his wife, Augustina. His brother David, sister Candice, mother, and father-in-law had all come to town, and wanted to stay until the body was found. So we continued the search again on July 25. 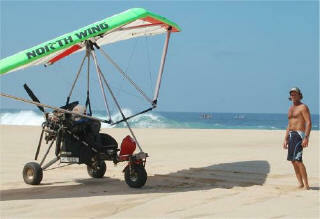 We flew about 60 miles of coastline, South of Cabo San Lucas and North of Pastora point, searching for the body. After spotting about every bat ray, shark, sea lion, and fish between Cabo and Los Cerritos, we finally located the body on the rocks, just North of the Los Cerritos bay. It had been swept up into a rock channel and hidden infront of the cliffs. It had now been in the water for 4 days, and was beginning to decompose. The family was able to identify the body and are now working to return it back to the United States for burial. Both families are devastated, to say the least, but can now deal with closure. 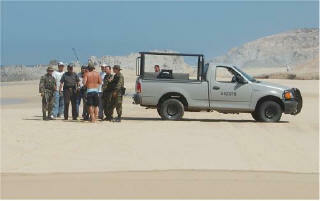 After struggling with the body the night before, we located it again the next morning, 15 miles South of Cabo San Lucas. Notifying the marines on the beach, they called in a boat. When the marine boat came, they were directed to the body. A second marine boat was called in to assist. In this photo, they are pulling the body onto the deck of the red boat. In this photo, the marine boats are leaving, and we thought the job was over. A few minutes later, after talking to a 23 year old boy on the beach, I discovered it was not the body we were searching for. 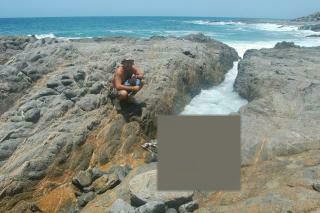 It was the body of Francisco Sandoval, a Mexican National who was fishing from the nearby rocks before drowning. The boy on the beach was his son. 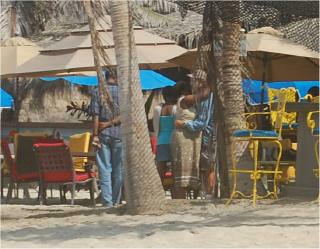 Linward Garrett Jr. (L) and wife Augustina (R) came to Cabo to celebrate their 1st year anniversary. After finding out the first body was not Linward, I met with the family again, hugged the mother, and promised to continue the search. Later in the day, on July 26th, the body was found after scouring hundreds of miles of ocean. It was located just North of Los Cerritos, in a remote rocky area, and had washed up a rock channel from the ocean. The family was lead down to the body, where it was identified as the missing person, Linward Garrett Jr.
Below is a photo of Gilberto Perez, from a ranch in the hills East of Pescadero. 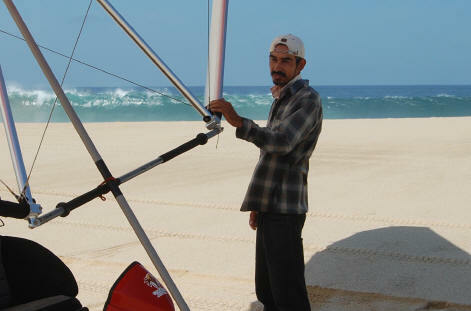 Gilberto flew with me for days, has a excellent eye, and was an incredible help.